The year begins in spring, and is divided into reš šatti "beginning", mišil šatti "middle", and kīt šatti "end of the year". The word for "month" was arḫu (status constructus araḫ). That the calendar originates in Babylonian, and not in later Assyrian times is shown by the fact that the chief deity of the Assyrians is assigned the surplus intercalary month. During the 6th century BC Babylonian exile of the Hebrews, the Babylonian month names were adopted into the Hebrew calendar. The Assyrian calendar used in Iraq and the Levant also uses many of the same names for its months, such as Iyyar, Tammuz, Ab, Elul, Tishri, and Adar. ~ Araḫ Ve-Adār Ashur In year 17 of 19-year cycle, the intercalary month was named Araḫ Ulūlu. Until the 5th century BC the calendar was fully observational, but beginning about 499 BC the months began to be regulated by a lunisolar cycle of 19 years equaling 235 months. Although usually called the Metonic cycle after Meton of Athens (432 BC), Meton probably learned of the cycle from the Babylonians. After no more than three isolated exceptions, by 380 BC the months of the calendar were regulated by the cycle without exception. In the cycle of 19 years, the month Adaru 2 was intercalated, except in the year that was number 17 in the cycle, when the month Ululu 2 was inserted. During this period, the first day of each month (beginning at sunset) continued to be the day when a new crescent moon was first sighted—the calendar never used a specified number of days in any month. 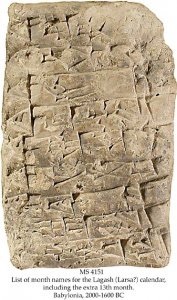 Counting from the new moon, the Babylonians celebrated every seventh day as a "holy-day", also called an "evil-day" (meaning "unsuitable" for prohibited activities) . On these days officials were prohibited from various activities and common men were forbidden to "make a wish", and at least the 28th was known as a "rest-day" . On each of them, offerings were made to a different god and goddess, apparently at nightfall to avoid the prohibitions: Merodach and Ishtar on the 7th, Ninlil and Nergal on the 14th, Sin and Shamash on the 21st, and Enki and Mah on the 28th. Tablets from the sixth-century BC reigns of Cyrus the Great and Cambyses indicate these dates were sometimes approximate. The lunation of 29 or 30 days basically contained three seven-day weeks, and a final week of eight or nine days inclusive, breaking the continuous seven-day cycle. Among other theories of Shabbat origin, the Universal Jewish Encyclopedia advanced a theory of Assyriologists like Friedrich Delitzsch that Shabbat originally arose from the lunar cycle, containing four weeks ending in Sabbath, plus one or two additional unreckoned days per month. The difficulties of this theory include reconciling the differences between an unbroken week and a lunar week, and explaining the absence of texts naming the lunar week as Shabbat in any language. The Babylonians additionally celebrated the 19th as a special "evil day", the "day of anger", because it was roughly the 49th day of the (preceding) month, completing a "week of weeks". Sacrifices were offered to Ninurta and the day dedicated to Gula, and it may be supposed that prohibitions were strengthened. Further, reconstruction of a broken tablet seems to define the rarely attested Sapattum or Sabattum as the full moon. This word is cognate or merged with Hebrew Shabbat, but is monthly rather than weekly; it is regarded as a form of Sumerian sa-bat ("mid-rest"), attested in Akkadian as um nuh libbi ("day of mid-repose"). According to Marcello Craveri, Sabbath "was almost certainly derived from the Babylonian Shabattu, the festival of the full moon, but, all trace of any such origin having been lost, the Hebrews ascribed it to Biblical legend." This conclusion is a contextual restoration of the damaged Enûma Eliš creation account, which is read as: "[Sa]bbath shalt thou then encounter, mid[month]ly." Parker, Richard A. and Waldo H. Dubberstein. Babylonian Chronology 626 BC.–AD. 75. Providence, RI: Brown University Press, 1956. ↑ 1.0 1.1 Pinches, T.G. (2003). "Sabbath (Babylonian)". In Hastings, James. Encyclopedia of Religion and Ethics. 20. Selbie, John A., contrib. Kessinger Publishing. pp. 889–891. ISBN 978-0-7661-3698-4. Retrieved 2009-03-17. This page was last modified on 24 July 2015, at 06:24.